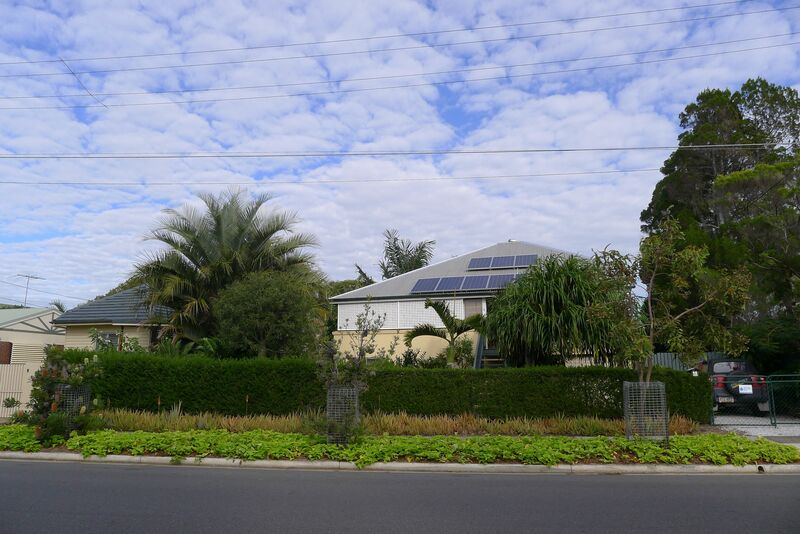 Leave Brisbane’s suburbs behind as you visit 813 square metres of rural Wynnum. Check out my award-winning, thrifty sustainable garden: blue bananas, stingless bees, home grown bath sponges, and turf mostly mowed by guinea pigs. See how a decade of organic gardening has converted uncompromising acid sulphate soil into a wonderful, crumbly, worm-filled tilth. Discover how intensive, organic food production on 100 square metres of good soil can feed an adult all year round, currently (in July) putting 91 different plants on the winter menu. * 10am to 4.30pm, Sat 9th & Sun 10th August. * Entry $8, under 18 entry is free, SO INVITE YOUR SCHOOL! Bellis generates more solar power than it consumes, rainwater is harvested for drinking, cooking and washing, stormwater is almost totally eliminated, and waste water recycled for gardening. Nineteen species of native bee have replaced the need for the European honeybee. Over 425 species of animal are now a part of the dynamic ecology of this maturing garden, including discoveries – species new to science. This year l will be joined by Jo Hammond of Butterfly Host Plants. Jo will answer your insect-friendly queries and offer butterfly-friendly plants for sale. I’ve been busy making jam from my organic, home grown fruit, and I’m adjusting my garden for the emerging El Nino drought. It has been a weird autumn and start to winter, so sowing and planting have been affected. Hopefully, the bee-friendly Hibiscus insularis hedge will be blooming so you can enjoy one of Australia’s rarest wildflowers. I dunno about mornings being THAT laid back. There’s usually a queue when we open! I’m so disappointed! Previously I’d seen your open day listed on the Open Gardens website as the last weekend of August. I was so looking forward to seeing your garden – I reminded my husband every week not to plan anything for the last weekend in August! 🙂 Totally devastated I missed it. I open every year through Open Gardens Australia. My apologies, always best to check the OGA website, which can – and is – regularly updated unlike the printed guide book. It’s not uncommon for gardens to cancel open days after bad weather events. Hope to see you in May 2015!